KAYA Sleep is one of the most exciting new companies to emerge in 2017! However, it has nothing to do with a glitzy, hype filled ad campaign. KAYA’s strength is quality and substance. While keeping prices affordable, they’ve created a mattress that not only rivals, but exceeds higher priced competition. KAYA’s mantra is simple, make a product that is “Just Better!” Better, materials, better price, better sleep! KAYA Sleep has been awarded our Best Mattress for Back Sleepers under $2,000! 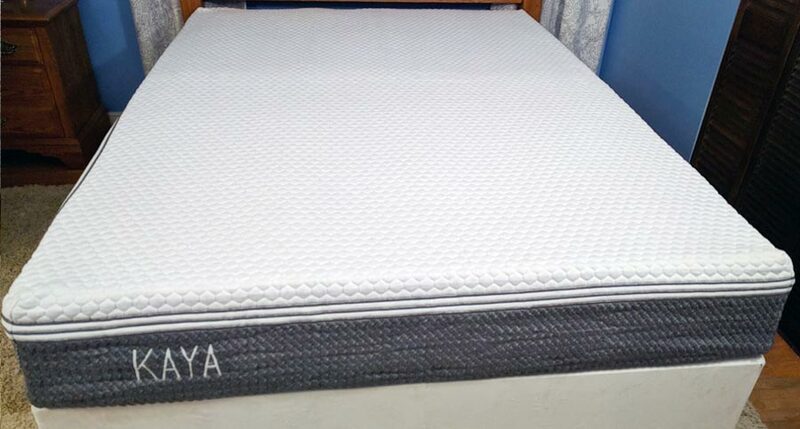 We spoke with the team at KAYA about the construction of their mattress and especially appreciated the honesty and transparency they offered on their build quality. They believe the product specs speak for themselves. We were most excited about the high coil count, edge to edge support and foam densities. The KAYA hybrid mattress is built in the USA. It combines a superior individually pocketed coil system with high density memory foam. The result is a bed that boasts the best attributes of both technologies. The Cover: KAYA Sleep utilizes a continuous knitting process that allows for more stretch and responsiveness. Unlike a traditional woven damask, the fabric easily conforms to body movement to provide the maximum benefits of both foam and coil. The flatter surface makes the material soft, smooth and comfortable too. ThermoGel has been infused directly into the cover. This starts the cooling process the moment you touch the bed. Responsive HD Foam: 1” of 5-lb. support foam provides durable comfort and support. This weight is significantly higher than most standard bedding. Memory Foam: The second foam layer consists of a 2” layer of high quality memory foam. At 4 lbs, the density is more in line with a premium Tempur-pedic or Serta iComfort than a value priced mattresses. Expect great pressure relief from foam of this quality. Transition Foam: The third layer: A 1” of 2 lb. density foam provides deep compression support and additional pressure relief. Pocketed Coils: Surrounded by two layers of support foam, KAYA’s individually pocketed coil unit is undoubtedly its most impressive feature. With over 1,000 coils in a standard queen, it has 20% more steel than most comparably featured hybrids. You won’t find any compromising here when it comes to support. Full edge to edge steel means a larger more consistent sleep surface and better edge support. Using coils all the way to the edge not only enhances support, it allows for better cooling than foam encasement. The stability and structure of this system also dramatically increases overall durability. Pocketed coils also limit motion transference and offer great contouring. It’s a great feature for couples who want to sleep undisturbed by their partner’s movements. We noticed little to no motion detection. 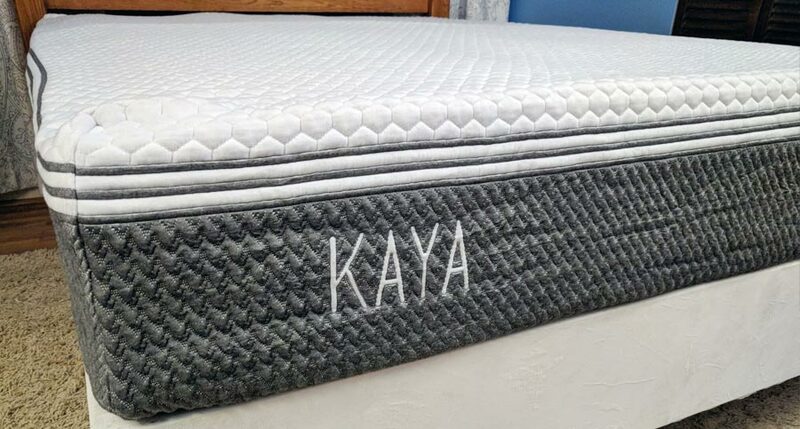 Over 1,000 Edge to edge pocketed coils and above average foam densities give the KAYA mattress superior support and stability. 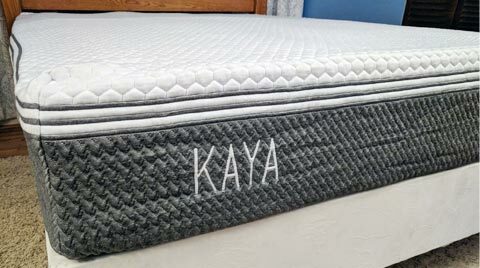 KAYA Sleep’s dense foams and individually pocketed coils do an exceptional job of relieving pressure points. Most will find KAYA’s Medium Firm soft enough for their comfort needs. That said, some side sleepers require even more conformity. If KAYA had an alternative plusher option available, this rating would be higher. We found little to no motion transfer with KAYA Sleep. The combination of high density memory foam and pocketed coils significantly limit sleep disturbance. This is a high rating for a coil spring mattress. Unlike spring-less memory foam mattresses, KAYA Sleep’s hybrid design provides great ease of movement. The underlying coil structure permits greater mobility than spring-less memory foam options. It’s a great feature for couples who want to sleep undisturbed by their partner's movements. We noticed little to no motion detection. ThermoGel infusion creates a cool to the touch feel. Also, edge to edge coils encourages better airflow than foam encasements. We found the KAYA to sleep to sleep quite cool and comfortable. During our KAYA mattress trial, we did not notice any strong unpleasant odors. Upon opening the packaging, there was only a mild “new mattress” sent that quickly dissipated. All KAYA foams are CertiPURE certified to not emit dangerous toxins. Based on the coil structure and foam densities, KAYA should yield substantial support and comfort life. Edge to edge perimeter coil support gives the KAYA mattress an edge over foam encasement. 120-day comfort trial should be more than adequate to know whether this mattress is right for you. KAYA’s 20 year warranty is twice as long as most mainstream retail mattresses. Delivery is free; which is a pretty standard feature these days with online mattresses. KAYA states your mattress will be delivered to your door within 3 - 10 business days via UPS. It’s a pretty conservative estimate that allows for unforeseen shipping delays. We actually received ours within two business days. The KAYA is quite heavy and in home setup is not an option. Be sure to have a second set of hands available. Memory foam mattresses are not known for ranking high in this category. However, quality hybrids like KAYA, allow for greater ease of movement than spring-less memory foam offerings. Kaya’s solid individually pocketed coil unit and quality foams provide great support and comfort. This mattress is priced well below comparable retail products with similar specifications. Most side sleepers will notice more than adequate pressure relief for shoulders and hips. The KAYA’s universal medium firm feel will please most, but not all side sleepers. Those with pressure sensitivity issues who prefer an ultra plush mattress may want to pursue other options. Back sleepers will appreciate exceptional alignment with just the right amount of contouring and conformity. KAYA is our choice for best mattress for side sleepers under $2,000. You have probably already heard, stomach sleeping is not considered the healthiest way to sleep. That said, once formed, sleep habits are hard to change. For those that do spend some, or all of their time on their stomach should find the KAYA Sleep hybrid a good fit. It’s firm enough to prevent your lower back to dip too deep. For this reason, super soft mattresses sometimes cause stomach sleepers lower back pain. Tremendous edge to edge support is derived from a over 1,000 individually pocketed coils. Sleeps cooler than most memory foam hybrids. ThermoGel is infused directly into the cover. The cooling process starts the moment you contact the mattress. Air passes freely through the coils for additional breathability. 20 Year warranty is above and beyond the norm. Quality components make it easy to believe this warranty is legit. No off gassing issues. All KAYA Sleep foams are CertiPUR certified to not emit dangerous toxins into the air. Motion Transfer is low thanks to the combination of high density memory foam and individual coils. Always a great feature for couples not wanting to be disturbed by their partner’s movements. Only one comfort option: The KAYA’s Medium Firm mattress is a great feel for most, but not all sleepers. If you have pressure sensitivities and are looking for an ultra plush mattress, you’ll need to find another option. No White Glove in home delivery service offered. The KAYA hybrid mattress is quite heavy. Most people will require two sets of hands to bring into the house. With assistance, setup is quite easy. You’ll like KAYA If you want the pressure relieving benefits of memory foam but prefer the support of coils. Those seeking solid support edge support will appreciate KAYA. This mattresses edge to edge coil support creates a broader more consistent sleep surface than foam encasement. If you’re looking for a cooler sleeping memory foam option, the KAYA hybrid might be for you. ThermoGel technology and a design that allows for easy airflow keep you sleeping cool and comfortable. You’ll like KAYA if you feel more comfortable with a company that fully discloses their product specification. No smoke and mirrors here; just an honest upfront business approach. If you are looking for a really firm or super soft mattress KAYA is not for you. They currently produce only one comfort option. Their “medium firm” mattress will accommodate most but not all comfort preferences. Those who prefer the feel of an all foam mattress may not care for KAYA. Although this mattress offers nice pressure relief, it will probably appeal more to those who prefer a traditional innerspring. Upon arrival, the first thing you will notice is that the mattress is heavy! At 114 lbs for a standard Queen, it weighs considerably more than your average bed in the box offering. For that matter, it’s more substantial than many retail mattresses. Of course, weight here is a direct reflection of the quality KAYA Sleep delivers. This kind of support and comfort can’t be duplicated with lighter weight, lesser quality components. For most people, this means having an extra set of hands available to bring your mattress into the home. The good news is, once inside, set up is a breeze! For ease of setup, we recommend placing your mattress on the foundation before unwrapping. The KAYA rolled up in its packaging. Carefully break the seal allowing your KAYA Mattress to unroll onto your bed. It will require a few hours to take full shape. The KAYA, will continue to expand slightly over the next 48 hours. Although this additional expansion is visually negligible, we found that the mattress became a bit softer over this period. Once open, it’s hard not to notice KAYA’S unique structural attributes. Feel along the edge of the mattress as the steel expands. You’ll feel support all the way to the edge around the outside perimeter. 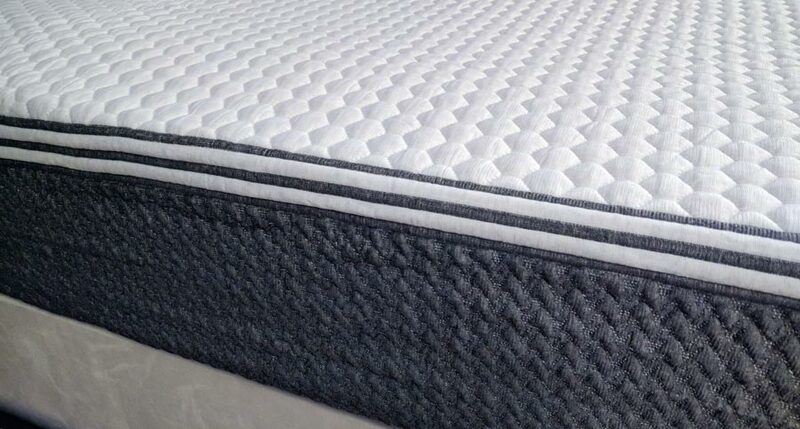 Typical foam edges lack consistency with the rest of the mattress and tend to retain heat. KAYA Sleep has spared no expense to create maximum edge support and comfort. High density quality foams also weigh more than cheap convoluted foams. The difference in performance here is significant. Although it has clean pleasing lines, aesthetically, the KAYA hybrid mattress is not glamorous in appearance. It’s real beauty comes in the the form of support, comfort and value! With over a thousand individually pocketed coils and high density foams, we found this mattress to be an exceptional value. It performs as well or better than beds priced almost double the price. We highly recommend KAYA Sleep.